Las Olas Chabad Jewish Center Where everyone is family! When it comes to our youth, the Chabad-Lubavitch philosophy is simple: Education is not limited to the hours a child sits in a classroom, but must become a way of life. Through an exciting mix of hands-on programming, children at Chabad learn the importance of kindness and good deeds, and experience fun and interactive programs about Jewish history, holidays and practices. 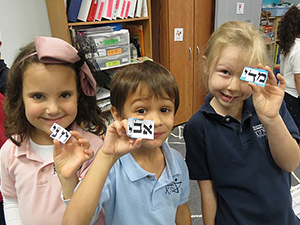 Inspiring Jewish Pride and Identity and Jewish children - the future of Judaism. As children near the age of Bar/Bat Mitzvah, special private training is available to prepare them for this important milestone in a meaningful way. The Friendship Circle extends a helping hand to families who have children with special needs and involves them in a full range of social experiences. The Circle's unique formula introduces teenage volunteers to the children and through shared experiences both are enriched. Check out the "Kids Zone" featuring fascinating and engaging games, activities, stories and more on Jewish holidays and other Jewish topics, geared towards children.